Transforming your property into a beautiful work of art can be an incredibly exciting endeavor and even more so if the entire process goes smoothly. When making the decision to hire a landscape designer you want to make sure you avoid any surprises that may pop up mid-project as much as possible. To avoid such instances, you want to raise the right questions prior to beginning and throughout the duration of your project. Before you even begin your search for a landscape designer, you want to make sure you know what you are looking to have done. It helps to walk around your property and write down a “wish list” so to speak, of projects you would like to have completed. Make a list of projects you yourself would like to complete and which projects you would prefer to have a professional do. Writing out your thoughts and ideas will help give you a clear sense of what you want to have done before speaking to a professional. Once you’ve found landscape designers that you would like to contact, asking the following 4 questions will make sure that you end up hiring the right person for the job. 1. What services do you offer? You want to make sure that the landscape designer you are thinking of hiring can provide you with the services you are looking for. Landscape designers fall into one of three categories: design only, design-build and full service design-build-maintain. Knowing what services a company offers will help you chose the one that is best suited for your project. 2. Can I see examples of your past work? If you are looking for your property to have a certain style, you want to make sure that the landscape designer has worked on other projects with that same style. You want to hire someone who can bring your dream landscape to life and have it be everything you envisioned and more. 3. Is work done in house or is it subcontracted out? It’s always good to find out who is actually going to be completing the project. Some landscape designers use subcontractors for certain aspects of the job such as hardscape installation or carpentry features. It’s best to work with a company who will be in control of every phase of the job – if the landscape designer uses a subcontractor, if that person has a problem it could throw off the entire job. 4. What is your process? 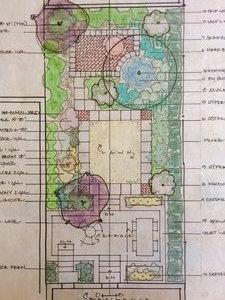 A landscape designer’s process will depend on what services the company offers. Understanding the process of completing your project will allow you to know what to expect throughout the duration of your job. You also want to be honest with the designer about your budget – setting a budget up front is incredibly important because it will tell the designer not that they need to spend the entire budget, but what they can accomplish within the set budget. You want to find a landscape designer who can help you to bring your landscape vision to life – someone who can complete the job within your budget without skimping on the creativity. Asking these questions first will give you that leg up on your project and better prepare you for the entire process. A well-designed and maintained landscape can increase your property value by at least 20%. With an investment like that, you absolutely want to be sure you are getting your dream landscape from a design professional who will provide you with exceptional service from start to finish. Spring season is a time of regeneration and renewal as you prepare to bring life back to your lawn and garden. Taking the proper steps after seasonal changes or severe weather conditions can prove to be the difference between creating a breathtaking landscape or an outdoor space with unsightly mishaps. By following a few simple steps, you can take pride in your backyard year after year. With warm weather on the way, many Americans will be heading outdoors. Whether you’re beautifying your landscape with a lawn mower and hedge trimmer or using a chain saw to clear space for that deck you’ve always dreamed of, it’s important to take proper care when using outdoor power equipment. Safety measures help protect both the equipment and the people using it. “Many people are so eager to pull out lawn and garden equipment once spring arrives that they sometimes forget basic steps to ensure the powerhouse of the equipment – the engine – is in good working order,” says Kris Kiser, president and CEO of the Outdoor Power Equipment Institute (OPEI). Sense of depth – “We use some lights along pathways, some on the house, and some within landscaped beds to provide a feeling of depth in the landscape,” says Matt Barton of Coppercreek Landscaping, Inc. in Mead, WA. Fuel keeps your outdoor power equipment going, so it’s important to use it properly and safely. Before starting any equipment this spring, be sure to drain old fuel from the tank – especially if it’s been sitting all winter. Untreated gasoline left sitting in a tank for more than 30 days can deteriorate and destabilize, causing problems starting or running equipment. In some cases, bad gas can even damage the fuel system. After you’re done using the equipment, switch the fuel valve off and leave it that way until it’s time to use the equipment again. Fill a lawn mower’s tank between uses to minimize the amount of air in the tank. Store gasoline in a clean, sealed plastic container that’s specifically intended and designed for fuel storage, and store it away from direct sunlight. When it’s time to refuel your equipment, be aware of the type of gasoline it needs and look before you pump. “Don’t assume that the gas you put in your car can still go in your mower, chain saw or generator,” Kiser cautions. Never use greater-than-10 percent ethanol gasoline blends, which are now commonly available at gas stations throughout the country and may be lower in price than other blends. It is illegal to use higher-ethanol gasoline blends in small engines such as your lawn mower, leaf blower or trimmer. What’s more, such fuels can be harmful and cause damage to small engines. Be aware of what blender pumps look like. These pumps dispense higher ethanol fuels such as E15, E30 and E85 blends. Know when it’s appropriate to use them and when it’s not. To learn more about proper fuel use in smaller engines, visit OPEI’s educational site www.lookbeforeyoupump.com. Read and understand your owner’s manual, which contains the manufacturer’s instructions for taking care of your small engine, including fueling instructions. * When operating a lawn mower, start with basic safety concerns such as wearing the proper attire, including substantial shoes (no sandals or flip-flops), long pants and snug-fitting clothes. Inspect the mower for loose belts or hoses before you start it. Be sure no one else is nearby as you prepare to start the mower, especially children and pets. If you have a riding mower, start it while sitting in the driver’s seat, never while standing beside the mower. Always slow down when operating any mower on a slope or difficult curve. * When operating a chain saw, wear protective gear such as safety footwear, gloves, chaps, safety goggles and hearing protection. Never carry a running chain saw when it isn’t being used, and be sure your work area is clear of debris that could trip you while operating the saw. Keep other people out of your work area. If you’re cutting down a tree, plan a retreat route for when the tree falls. Be aware of “kickback,” which can happen when the nose or tip of the guide bar touches an object, or when the wood you’re cutting pinches the saw chain in the cut. These scenarios could result in the guide bar kicking back toward the user. * As you use an edger or trimmer, take safety measures such as wearing protective gear and ensuring that your work area is clear of any stones or debris that could fly up. Stop the motor when moving from location to location with your trimmer, and never put your hands or feet near the cutting area. Taking precautions to ensure your outdoor power equipment is fueled, used and maintained properly will help to keep you safe and your equipment in good shape throughout all seasons.